The Chicago Red Stars and Sky Blue FC played to a 1-1 draw on Saturday night at Toyota Park in Bridgeview, Illinois. The Red Stars are now 2-1-2 and in second place in the NWSL. Sky Blue moved into eighth place with the draw and are now 0-2-1. Chicago Red Stars midfielder Sofia Huerta kicked off the scoring in just the first minute, with a goal 44 seconds into the game. Huerta hit a right-footed cross that carried to the far post and went over Sky Blue FC goalkeeper Kailen Sheridan to give the Red Stars a quick 1-0 lead. It’s the fifth-fastest goal in NWSL history, and the second-fastest in Red Stars history. Alyssa Mautz scored at 40 seconds in 2013. It’s Huerta’s second goal of the season, to go along with two assists. Sky Blue FC lost their first two games of the season by the score of 1-0, and looked headed to a third straight loss by the same scoreline until late in the second half. 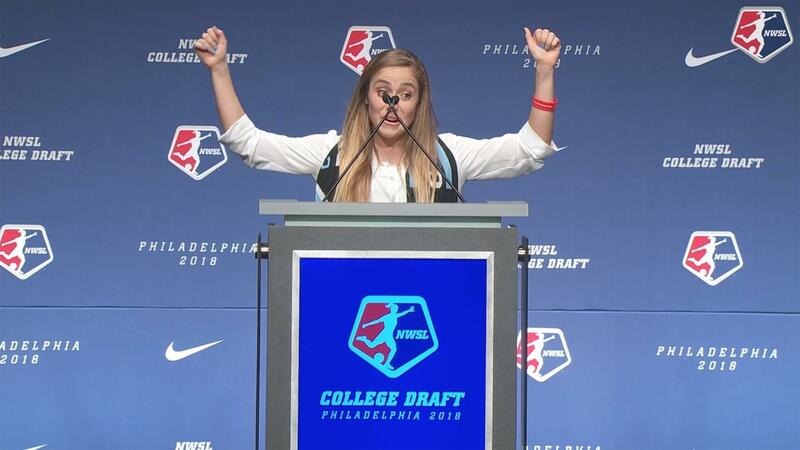 Sky Blue FC midfielder Savannah McCaskill scored her first NWSL goal to tie the match in the 78th minute. 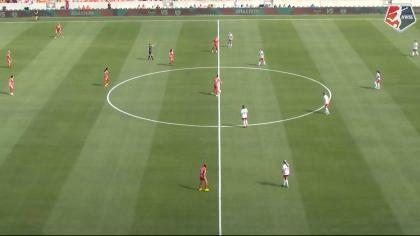 With McCaskill dribbling at the top of the box, Carli Lloyd made a slicing run to the left side of the area that drew several defenders. McCaskill then cut inside and took a shot into the open space. Her shot deflected off Taylor Comeau and into the back of the net. Comeau started in place of Sam Johnson, who was a late scratch. Alyssa Naeher made three saves in the game for the Red Stars, her best coming in the 62nd minute on an effort by Lloyd. Sheridan made five saves for Sky Blue FC in the game, including a nifty kick save in the 25th minute that cleared the ball well out of danger. It was an evenly matched draw, with the Red Stars barely grabbing the possession edge — 50.1% to 49.9% according to Opta. The Red Stars took six shots on goal, while Sky Blue FC had four. The draw for Chicago comes in what will likely be their last game without 2017 NWSL MVP Sam Kerr, who returned from international duty on Saturday and was on the sideline for the Red Stars. The Red Stars next face the Spirit on the road on April 28. It also came at the end of a stretch of three games in eight days, and the Red Stars picked up seven points in the three matches. Sky Blue FC won’t play their next game until May 5, at home vs. the Houston Dash, as they have a bye in Week 5. Substitution, Chicago Red Stars. Lauren Kaskie replaces Danielle Colaprico. Substitution, Sky Blue. Madison Tiernan replaces Savannah McCaskill. Attempt saved. Shea Groom (Sky Blue) right footed shot from outside the box is saved in the bottom right corner. Assisted by Katie Johnson. Substitution, Chicago Red Stars. Summer Green replaces Michele Vasconcelos. Substitution, Sky Blue. McKenzie Meehan replaces Raquel Rodríguez. Attempt blocked. Danielle Colaprico (Chicago Red Stars) left footed shot from the centre of the box is blocked. Attempt blocked. Sofia Huerta (Chicago Red Stars) left footed shot from outside the box is blocked. Corner, Chicago Red Stars. Conceded by Carli Lloyd. Goal! Chicago Red Stars 1, Sky Blue 1. Savannah McCaskill (Sky Blue) right footed shot from outside the box to the bottom right corner. Assisted by Katie Johnson. Katie Johnson (Sky Blue) wins a free kick on the left wing. Attempt missed. Sofia Huerta (Chicago Red Stars) header from very close range is close, but misses to the right. Assisted by Danielle Colaprico with a cross following a corner. Corner, Chicago Red Stars. Conceded by Erica Skroski. Attempt missed. Carli Lloyd (Sky Blue) header from the centre of the box is close, but misses to the left. Assisted by Sarah Killion with a cross following a corner. Corner, Sky Blue. Conceded by Sarah Gorden. Offside, Chicago Red Stars. Katie Naughton tries a through ball, but Taylor Comeau is caught offside. Attempt missed. Nikki Stanton (Chicago Red Stars) right footed shot from outside the box is high and wide to the left. Attempt missed. Yuki Nagasato (Chicago Red Stars) header from the centre of the box is just a bit too high. Assisted by Arin Gilliland with a cross. Substitution, Sky Blue. Katie Johnson replaces Mandy Freeman. Attempt missed. Janine Beckie (Sky Blue) right footed shot from outside the box is too high following a corner. Attempt saved. Carli Lloyd (Sky Blue) left footed shot from the centre of the box is saved in the centre of the goal. Assisted by Shea Groom. Attempt missed. Michele Vasconcelos (Chicago Red Stars) right footed shot from outside the box is too high following a corner. Attempt missed. Arin Gilliland (Chicago Red Stars) right footed shot from the centre of the box is too high. Attempt blocked. Arin Gilliland (Chicago Red Stars) right footed shot from the centre of the box is blocked. Assisted by Michele Vasconcelos. Attempt blocked. Danielle Colaprico (Chicago Red Stars) left footed shot from the centre of the box is blocked. Assisted by Sofia Huerta with a cross. Attempt saved. Alyssa Mautz (Chicago Red Stars) right footed shot from outside the box is saved in the bottom right corner. Assisted by Arin Gilliland. Attempt missed. Savannah McCaskill (Sky Blue) right footed shot from outside the box is close, but misses to the right. Assisted by Janine Beckie. Attempt missed. Yuki Nagasato (Chicago Red Stars) right footed shot from outside the box is close, but misses to the left. Assisted by Michele Vasconcelos. Attempt blocked. Michele Vasconcelos (Chicago Red Stars) left footed shot from the centre of the box is blocked. Assisted by Sofia Huerta. Attempt saved. Michele Vasconcelos (Chicago Red Stars) right footed shot from outside the box is saved in the top centre of the goal. Offside, Sky Blue. Savannah McCaskill tries a through ball, but Janine Beckie is caught offside. Attempt saved. Alyssa Mautz (Chicago Red Stars) right footed shot from the right side of the box is saved in the centre of the goal. Assisted by Sofia Huerta. Attempt missed. Janine Beckie (Sky Blue) left footed shot from the left side of the box is too high. Assisted by Sarah Killion. Offside, Chicago Red Stars. Yuki Nagasato tries a through ball, but Alyssa Mautz is caught offside. Offside, Sky Blue. Shea Groom tries a through ball, but Savannah McCaskill is caught offside. Yuki Nagasato (Chicago Red Stars) hits the bar with a header from very close range. Assisted by Taylor Comeau with a cross. Attempt missed. Carli Lloyd (Sky Blue) right footed shot from outside the box is too high from a direct free kick. Offside, Chicago Red Stars. Nikki Stanton tries a through ball, but Alyssa Mautz is caught offside. Attempt saved. Arin Gilliland (Chicago Red Stars) left footed shot from the left side of the box is saved in the centre of the goal. Assisted by Michele Vasconcelos. Attempt saved. Carli Lloyd (Sky Blue) right footed shot from outside the box is saved in the centre of the goal. Assisted by Erica Skroski. Attempt missed. Arin Gilliland (Chicago Red Stars) right footed shot from outside the box is close, but misses to the right. Attempt saved. Sofia Huerta (Chicago Red Stars) right footed shot from outside the box is saved in the bottom left corner. Offside, Sky Blue. Shea Groom tries a through ball, but Janine Beckie is caught offside. Attempt missed. Raquel Rodríguez (Sky Blue) left footed shot from outside the box is close, but misses to the left. Assisted by Sarah Killion. Attempt missed. Raquel Rodríguez (Sky Blue) right footed shot from outside the box is close, but misses to the right. Assisted by Savannah McCaskill. Goal! Chicago Red Stars 1, Sky Blue 0. Sofia Huerta (Chicago Red Stars) right footed shot from a difficult angle and long range on the right to the top left corner. Assisted by Alyssa Mautz.